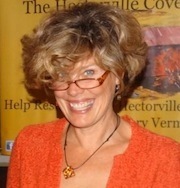 Vermont author Martha Oliver-Smith, whose memoir about her grandmother, Martha's Mandala, came out in November 2014 from Spuyten Duyvil. This week’s Write The Book Prompt was suggested by my guest, Martha Oliver-Smith, whose grandmother made many lists. Make a list – a practical one, such as a grocery list or a to-do list, or an unusual far-flung list, such as what you would like to do in your next life, or things you learned about some abstract concept (love or fear) - or someone. In Patty Oliver-Smith’s case, it was her grandmother and the many things she learned from her - in no particular order. She read to me and taught me how to read. That one should always try to be kind. She taught me how to darn socks, a skill I have never needed, thank god, but I am glad to recognize what a darning egg is. That one should always be respectful and gentle with animals because they know and feel things that we cannot. To watch out for fairies sleeping under the flowers in the garden. There are numinous places everywhere. She sang to me, songs and lullabies that I sang to my own children. How to play solitaire, and I am addicted to it--as she was. That the concerns and work of men carried more weight in the world than those of women. Though she never said this to me, it came from one of the voices in her mind, and I learned it; now I continue to un-learn it. She taught me how to make a good vinaigrette dressing, even though she hated to cook and only made salads and dried-up hamburgers or baked eggs on the cook's days off. She tried to teach me to paint with watercolors, but I had no patience or talent for it. She taught me to study and listen to people. That people are both funny and sad--sometimes at the same time. That organized religion is not all it pretends to be, and faith and belief are two different things. She explained what a paradox is and showed me how to live it, in it, with it. She never told me I couldn't do something because I was a girl. She gave me her gold bracelet with the name "martha" sculpted into it. I wear it for both of us when I have to present myself to the world as a serious grown-up. She gave me her mandala. The list itself can become a poem as you revise its linear form for line breaks, patterns, images, sounds etc. If you are working in prose, one or every item on the list can escape from the linear column with individual items to become a meditation expanded and elaborated with images, stories or scenes. The list can become a lyric or braided essay, depending on how far and deep you want to take the memory, imagination and language. The list will add up, whether short or long to something important that’s on your mind or in your heart. i.e. Why do you want/need those things on the grocery list or in your next life? What necessity, what memories of moments or scenes led to those items on the list?